Competition is rooted in comparison. When you look at the world, you are instinctively aware of other people's performance. Their performance is the ultimate yardstick. No matter how hard you tried, no matter how worthy your intentions, if you reached your goal but did not outperform your peers, the achievement feels hollow. Like all competitors, you need other people. You need to compare. If you can compare, you can compete, and if you can compete, you can win. And when you win, there is no feeling quite like it. You like measurement because it facilitates comparisons. You like other competitors because they invigorate you. You like contests because they must produce a winner. You particularly like contests where you know you have the inside track to be the winner. Although you are gracious to your fellow competitors and even stoic in defeat, you don't compete for the fun of competing. You compete to win. Over time you will come to avoid contests where winning seems unlikely. Let people know that being competitive does not equate with putting other people down. Explain that you derive your satisfaction from pitting yourself against good, strong competitors and winning. It is not satisfying to outperform a "hobbled" player. 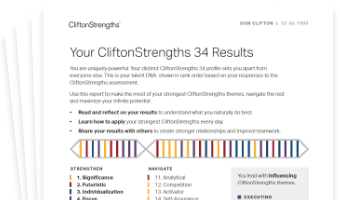 See how Competition shows in your CliftonStrengths results -- discover All 34 CliftonStrengths Themes today!